…Now it is a greater perfection for a thing to be good in itself and also the cause of goodness in others, than only to be good in itself. Therefore God so governs things that He makes some of them to be causes of others in government; as a master, who not only imparts knowledge to his pupils, but gives also the faculty of teaching others. In the traditional sense of religion, religion is what ‘binds’ us to God, that which unites us in a filial bond. We render God worship as He is the source of life and being in us and in creation. We see ourselves as dependent and also free. He governs all things perfectly and we are beneficiaries of this governance. In this way we can speak of a virtue of religion: the understanding that to be so bound, to be so united and to desire this union is a virtue, a proper way to live as persons. It may follow from this also that one of the purposes of religion is instruction; instruction not simply on truths of belief and faith, but instruction relating to the human, the real, the natural in us, and leading us to discover the supernatural about us. Fundamentally, the virtue of religion is natural in us insofar as we are created by God, in His image. The culturally forgotten notion of Imago Dei reveals to us that we are ‘religious beings’. To deny this is to deny an existential truth. Self-deception on this fact leads only down a long road to despair. This is precisely where the modern poverties of disbelief, skepticism, agnostic subjectivism and inherent indifference all require a different form of charity. Yes, poverty is normally understood as physical or material lack of whatever kind, and here material responses are required of us. The hungry, the naked, the imprisoned are the ones Christ points to as images of Himself to whom we must offer food, and clothing, and company. But the reality is also that for all the material poverty in the world, there exists an equally significant spiritual poverty in the world. And I dare say this is the greater one. For one can lose all things material, and still possess his soul. But should he lose his soul, he has lost all. And it is so, that to be left to wallow in the mire of modern confusion is as equally tragic as to be left to wallow in the mire of abject physical poverty. Fundamentally the experience of suffering is the same. Insofar as the body is in pain, the mind and heart are in pain as well. And if we respond to physical poverty as we should by offering material resources and better person centered solutions, we ought to respond to intellectual and spiritual poverty in similar vein: with reason grounded in wisdom and truth; with spiritual resources and soul centered solutions. It is no longer satisfactory to divide the body and soul. The past decades of modernity have taught us what the consequences of this approach are: genocide, mass market objectification of women and men and children, a total disregard for innocence, a global thievery of dignity now trampled in the most egregious ways. If we are just bodies we easily become disposable goods; commodities materially consumed for pleasure or profit or other perceived gain. If, however, we reclaim the notion of our intrinsic and inalienable dignity as persons: beings with a soul on which is imprinted the very likeness of God, then such abject destruction becomes more difficult to perpetuate. When it is enacted, tragically, it elicits the correct response from us: not the calloused indifference that is modernly common and familiar, but rather the scandal and horror and attempt at reparation that is proper to the waste of such superabundance. The different charity required of us in response to spiritual poverty is an intellectual charity. And by this I do not mean the complex theories of existence rendered in modern academic halls of philosophy, but rather the great gift of clarity as to our origins and our ultimate ends: happiness and beatitude. This charity is the proposal to pursue the work of reason so that it may reveal wisdom and truth; wisdom and truth that are real and intellectually defensible. It is the privileged acknowledgement that we are made to know Wisdom incarnate, Truth incarnate: Christ, who is God, incarnate. We suffer from having too much of nothing — nothing substantially satisfying. Intellectual charity is reason placed at the service of faith and hope. It is the capacity to teach another what the benefits and gifts of being ‘governed onto perfection’ are: that created in Imago Dei and washed in the waters of new birth we are given access to grace, so that the filial union we share with God is one we thrive in, grow in. We propose a union which perfects, build up, heals, restores and so reconstitutes what is most lost, impoverished, wasted, and broken in us. It is the invitation to discover the lavishness of God, in all of its grandeur and beauty. I did not need a blanket or a coat or a warm meal. To those who need these things we give not from our surplus but from our own need — the copper coins of the woman in the temple. What I did and still do need is the charity of a soul centered response to the interior suffering and longing common to the human condition and yet justified and explained away these days as mere physical want: want for pleasure, wealth, power. For all the material goods we can assemble and collect for ourselves, there are experiences of poverty that transcend mere want and affect even those who live the most lavish of lifestyles. This is a hidden and modern poverty, as it is the poverty of the soul. St. Thomas offers the answers for the particular poverty of my own soul. To borrow from a friend, he ‘unravels knots in the modern mind’ and opens the discovery to happiness. We long firstly to know that we have a soul that is worth saving. We long to know that we are more than our wounded bodies tell us we are. We long to know that the unity of our body and our soul is precious and irreplaceable. We long to know this gift is immensely valuable, and that it is further lavished with an inalienable dignity and the glorious freedom of the children of God. We long for the knowledge that God is real and loves us. We long for light in the darkness of disbelief. We long for forgiveness and for mercy. We long to be confident in something, and that something is Truth. We look for this truth, this wisdom, and this confidence. We desire the triumph of hope over despair. We want to be invited, to be challenged to believe. We are tired of hearing that believing is fettering, limiting; a retrograde way to live our modern lives. Lies exhaust us. They drain us of desire, or they drown us in it. We are made for more than mediocrity: we are made for happiness. The whole summary of the moral life that St. Thomas proposes is built on this foundation. And would we rediscover it, we might find ourselves breathing fresh air in the pollutions of modern apathy and skepticism, in the agony of loss of innocence, in the darkening of the mind sold to us as pleasure and escape. We would find ourselves breathing freedom. St. Thomas took seriously that one of the purposes of religion is instruction, and that preaching Truth and Wisdom is dispensing ultimate and endless wealth. Truth and Wisdom are real answers to real poverty. The fact is, that this sort of poverty, like other systemic forms of need, is not addressed overnight. Instruction grounded in wisdom and truth is the new response our culture yearns for in its aimless searching. We should propose this response as the antidote to modern spiritual poverty for however long it takes and because lives depend on this. Practicing intellectual and spiritual charity of this sort requires courage and the humility that teaches radical confidence in the Truth that sustains us. It is not easy to tell someone, however gently, that they are staking everything on sand — that they should aim for more because they are made for more. When I was told exactly this, and not left to wallow in poverty, the gate of hope was opened for me. As the first rays of morning light stream through the night sky and illumine the horizon, so too does the courage to preach and teach this form of charity illumine the souls of those we care for. ‘You are a daughter with a great inheritance.’ No truer words were ever spoken. No truer freedom ever unleashed in my life. Fifteen years have passed since my fist discovery of the deeply charitable thought of St. Thomas Aquinas in a university classroom. However much I read his writings and the work of those who have followed in his venerable tradition, I discover still more truth, more light, still more courage and more freedom. These are the hundredfold fruits of Truth and superabundant grace. An unbound soul is a far cry from pretensions of restriction and limitation we are told come from belief. To experience this charity and its fruits of peace, is to know a greater joy — the joy that God gives, and the world can not take away — a joy that triumphs in the agonies of suffering and despair. At the end of a lifetime of devotion and study St. Thomas Aquinas uttered his last words: ‘All I have written seems to me as so much straw’. As surprising and telling as this is of his own interior life, it remains to be said that straw is food for the nourishment of the flock. It was the source of warmth for the Savior born for us in a stable. The straw St. Thomas left the world has been the coat and home and nourishment I need; he still imparts knowledge that God first infused in him. 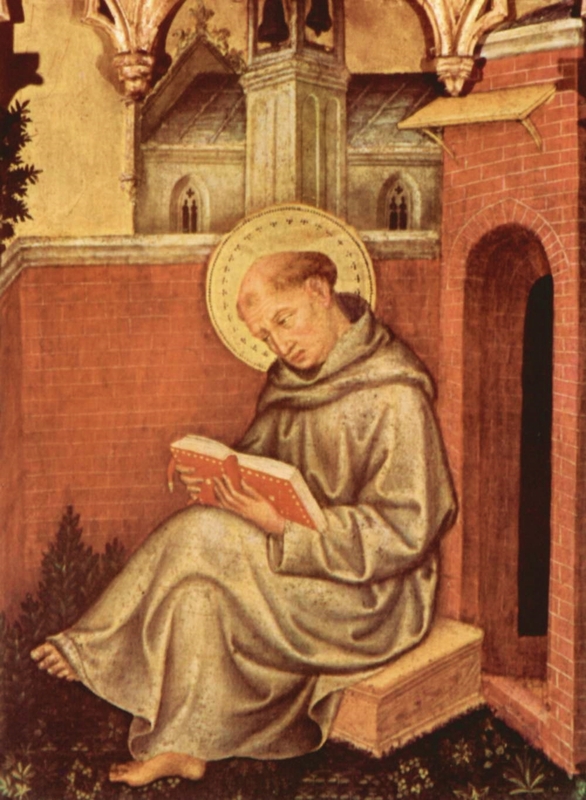 This is how a medieval scholar, Dominican friar, preacher, teacher, a saint — how St. Thomas Aquinas changed my life. And while the needs continue, this early respite for an interior poverty of soul is now reason enough to give thanks, and render some form of the favors first received. Souls need a different charity, yes for their final salvation, and now also for their happiness; happiness oriented to beatitude. Offering our contemporaries anything less is to treat them as less than persons. Nil Nisi Te, Domine — Nothing but you, O Lord. strengthen him by word and example.